Early models of the cosmos placed our species at the center. The Earth was the nexus of all existence, and we, the purpose for everything. It was a reasonable assessment, based on the evidence we had. From the perspective of a terrestrial observer, the Sun, Moon, planets, and stars appear to trace paths around us. Upon conducting the simplest inspection of the sky, anyone could see that we are special. We could rejoice: oh, how significant we must be! The entire universe is made for us, and the Earth acts as a pedestal, exhibiting our species at the center. This gratifying discovery was integrated into the language and disseminated by literature and education. It was rarely contested and remained predominant for some 1500 years. In the mid-16th century, a different hypothesis emerged to explain the motions of the heavens1—that which featured the Sun, rather than the Earth, at the center of the universe. It was widely ignored, disregarded as an outlandish proposal. However, with the advent of the astronomical telescope, evidence began mounting to bolster the notion, challenging the established system. The tenets of geocentrism gradually eroded. Support dwindled as heliocentrism was further substantiated by improved instrumentation. By the nineteenth century, the Earth-centered conception of the universe was dispelled. We were decommissioned from the leading role at cosmic center stage. The Sun superseded the Earth to hold the foremost position at the center of the universe. Nevertheless, this revision could still be conveyed to preserve the human-centered worldview. It was said that the distance from the Earth to the Sun was trivial when juxtaposed against the immense distances to the stars. By this reasoning, we could claim our displacement to be slight; we are nearly at the center of the universe. Heartened by a sense of significance, we found the cosmos, still, a haven for human pride. The cosmic model of even just a century ago is hardly recognizable when compared to our modern equivalent. At that time, the Milky Way galaxy was not regarded as merely an occupant of the universe, but rather, the universe itself. The entire cosmos was a sole congregation of stars, surrounded by darkness and void. Some astronomers, though, disputed the prevailing notion as spiral clouds, called nebulae, were more frequently witnessed in the depths of space. They thought the strange mists to be galaxies like the Milky Way—“island universes.” Once again, humanity’s privileged position had come under threat; perhaps we are not central figures in a single-galaxy cosmos, but the inhabitants of a starry isle that is one among a multitude of others. The astronomical community at large, however, considered this absurd. It was unimaginable. Spiral nebulae could not be independent stellar assemblies; they are most certainly local—just solar systems in formation—nested within the Milky Way. Due to a lack of compelling evidence in support, this newfangled theory was dismissed. We could then return with contentment to what was familiar, what was comfortable. We could sleep soundly in the heart of the cosmos. After a period of dormancy, the controversy surrounding the spiral nebulae resurged in the early 20th century. Heber Curtis was at the forefront of this ideological resurrection. An astronomer at the Lick Observatory in California, he was delegated the task of inquiring into the enigmatic clouds. Although at first he objected to the notion of exterior galaxies, Curtis was convinced otherwise as he accumulated new evidence. During his early research, Curtis imaged nebulae which had been previously examined and noticed an absence of rotational motion (a necessary condition to account for their spiral appearance). If the nebulae were to dwell within the Milky Way, such a rotary movement would be perceptible; if they were extremely large and distant, however, the movement would be too small to discern. Curtis dedicated much of his time during the 1910s to persuading the astronomical community. He lectured frequently, all the while developing and substantiating his arguments. Curtis became synonymous with the island-universe theory—the spokesman, advocating ours is a moderately-sized galaxy, 30,000 light-years wide, in which we are nestled just shy of the center; outside its periphery, there exist other assemblages of stars—a great cosmic citizenry of which the Milky Way is a part. Curtis’s contentions were not widely accepted. He and his colleagues composed a faction of island-universe proponents, while the majority remained steadfast in opposition. One such contesting astronomer was Harlow Shapley; once a subscriber to the island-universe theory, he rejected the concept, drawing from his own observations. Shapley had measured the distance to all of the known globular clusters—dense collections of stars orbiting the galactic center. The Milky Way, which was thought to span 10,000-30,000 light-years, he deduced was much larger—300,000 light-years across. Shapley then reasoned that such exceptional dimensions of this galaxy preclude the existence of others equal in size. The Milky Way is of such vastness, it must be the primary component of the universe. The spiral nebulae are therefore nearby, settled within the galactic edge. Although the single-unit cosmos persisted, the conventional model did not remain entirely intact. By Shapley’s calculations, our solar system is not ensconced in the cosmic hub, as it had always been; rather, it resides 65,000 light-years distant - an astounding and unforeseen displacement from the center of the universe. In 1920, these two astronomers, resolute in their respective theories, championing different universes, would come to clash. Curtis and Shapley engaged on the topic of the spiral nebulae at a meeting of the National Academy of Sciences. This historic confrontation was dubbed the “Great Debate.” However, it was really nothing of the sort. The interaction consisted of two successive lectures, given under the title “The Scale of the Universe.” It was just one feature during a three-day event and was hardly publicized. The greatness of the debate, however, evolved so dramatically over time that the encounter has since been reimagined as a fantastic brawl between two giants of astronomy. Shapley was first at the podium. Rather than directly addressing the spiral nebulae, he relied on implication. If he convinced the audience that the Milky Way is vaster than previously thought, then the nebulae, accordingly, would be considered local members. He, additionally, underscored his discovery that the Sun does not hold a central position in the Milky Way, noting that we had been duped by the appearance of the sky. Curtis began his lecture with a strike, fervently dismantling Shapley’s argument for the tremendous resizing of the Milky Way. Thereafter, Curtis directed his attention to the spiral nebulae, systematically presenting the array of evidence which he had amassed on the subject. Ultimately, there was no clear-cut victor. Essentially, nothing changed. Everyone departed with mindsets no different than they had prior. The spiral nebulae remained shrouded in mystery. Edwin Hubble, a talented and keen astronomer, stepped in soon after, determined to reveal the secret of the spiral nebulae and finally settle the long-fought battle. Hubble studied the Andromeda nebula at the Mount Wilson Observatory with a 100-inch telescope, the largest in the world at the time. He was on the search for novae—stars which rapidly and temporarily increase in luminosity. Novae had been spotted in Andromeda before and used to calculate its distance, but the limited knowledge of the stellar processes caused wildly varying results. Hubble thought that further sightings might advance the investigation of the nebulae and, perhaps, uncover their true nature. Hubble imaged Andromeda and identified three objects which he suspected to be novae. 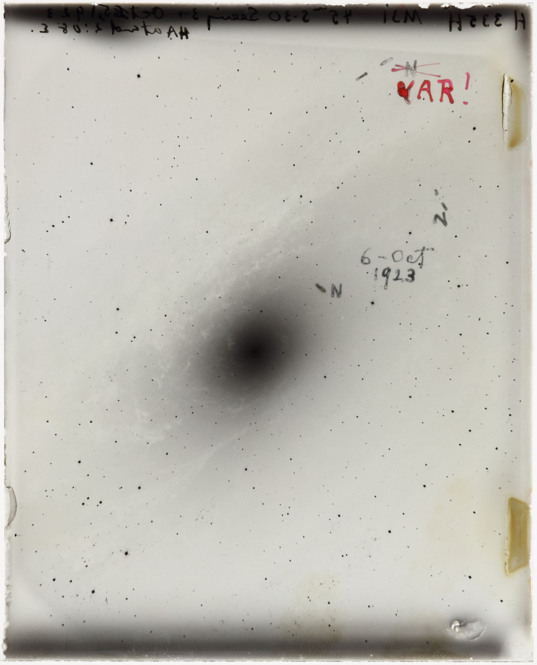 On the resulting photographic plate, he denoted them: “N.” However, upon consulting earlier photos of the nebula, he noticed that one of the three so-called novae acted atypically. The star was not absent from the archived plates—as would be the case for the transient flare-up of a nova—but rather, the star brightened and dimmed regularly, from one plate to the next. It was, in fact, a variable star; Hubble soon recognized the variable to be a Cepheid. Classified as “standard candles”—astronomical objects with known luminosities—Cepheid variables are precise distance markers, reliable tools for cosmic measurements.2 Elated by this discovery, Hubble crossed out the mistaken “N” and wrote beneath: “VAR” (indicating variable), accompanied by an exclamation point. At last, Hubble was able to perform a definitive calculation of distance. A profound conclusion followed: the Andromeda nebula is not within our galaxy. It is exceedingly beyond—900,000 light-years away3—far surpassing even the most generous estimates of the size of the Milky Way. Andromeda, as well as the other spiral nebulae, are not nebulae; they are galaxies, each one enormous and remote—vast collections of stars, marooned in the great cosmic ocean. Concerning the issue of the spiral nebulae, Curtis was correct. Shapley, however, was correct on other matters. Indeed the Milky Way extends much farther than previously considered4 and our Sun is situated at a great distance from the center. Shapley displaced humanity from where it had previously held sway. No longer are we in the core of the Milky Way, but in a quite unexceptional locale, thousands of light-years away. The late 20th century saw the dawn of space-based studies of the universe. The Hubble Space Telescope was the first major observatory carried into orbit and is now a widely-celebrated champion of modern astronomy. When the new space telescope was named after the eminent astronomer Edwin Hubble, we had not the slightest inkling as to what the exploratory namesake would uncover and how fitting that posthumous honor would prove to be. 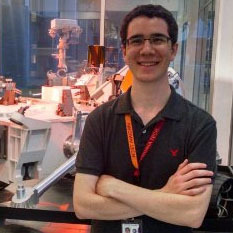 In 1995, the astronomer Dr. Robert Williams was serving as director of the Space Telescope Science Institute, the operations center for the Hubble Space Telescope. Accordingly, he was allocated 10% of the telescope’s observing time. Williams formulated a rather daring scheme: he would point the telescope at an empty region of the sky, lacking known celestial phenomena—devoid of anything considered at all interesting or remarkable—in hopes of seeing distant galaxies. However, he encountered criticism from his colleagues who thought that the telescope would be incapable of detecting the faint galaxies Williams anticipated and feared the fallout should this experiment be nonproductive. Nevertheless, Williams believed that the potential discoveries justified the gamble. He assembled a team and proceeded with his galactic quest. For more than 100 hours, over ten days, the Hubble Space Telescope observed an unimpressive sliver of sky. The resulting composite image, the Hubble Deep Field, is among the most iconic snapshots of the universe. 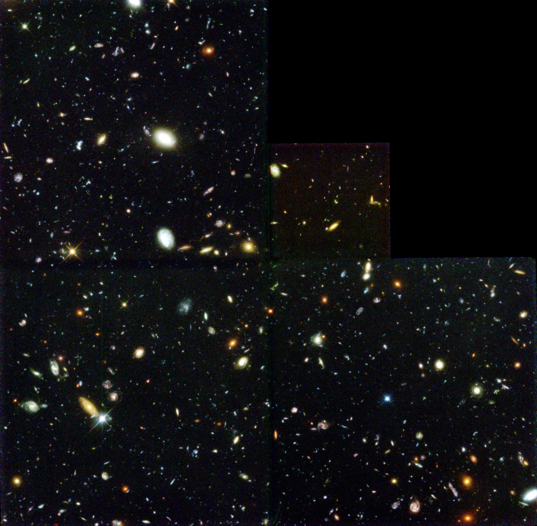 Subsequent deep field images were compiled using the Hubble Space Telescope as the onboard technology improved. The Hubble Ultra Deep Field and the Hubble eXtreme Deep Field are deeper views into the universe than their predecessor, capturing vistas of space and time never before seen. Extrapolating from these images to fill the entire sky, we acquaint ourselves with an astonishing and grand cosmos, populated by at least 100 billion galaxies. Since our most humble days as novice stargazers, the known universe has profoundly expanded. A cosmos once thought to be of modest proportions—consisting of the Sun, the Moon, a few planets, and a smattering of stars—we have discovered to be dimensions of unfathomable immensity and brimming with galaxies. While these cosmic revelations are stirring and magnificent, in their wake, we are confronted with different conditions—a newfound universe with which to reconcile ourselves. Much has changed since the days when feeling important was just a matter of looking up. The breadth of the universe reduced us. As we came to understand the vastness, our notions of significance degraded and fell apart. We then found ourselves rummaging through the wreckage of what we thought made us special, searching for a scrap - something, anything which we could salvage. But it became apparent that the universe is not obliged to honor our expectations, nor our dearest wishes. For now, we are tethered to this planet. The myriad galaxies, stars, and worlds are showcased beyond reach; human embrace lingers far-off in time. But the Earth is easily accessible. If we cannot generate some enormous and powerful impact in the universe, at least we can do so on our home planet. We can change the world. The idea seems inherently optimistic, but the prospect – admittedly - unlikely. We question how we might be the agents of sweeping phenomena. Even on this immediate planetary stage, we appear quite small players. Yet, the consequences of our daily activities indicate otherwise. Upheavals in the global environment now threaten our livelihood and put our long-term survival in doubt. We are changing the world. All of us. Every day. But we are changing it into something we never wanted it to be. We are not at the center of the universe, but we are at the center of our own lives. We are responsible for our actions and interactions, for our progressions and retrogressions, and for what becomes of our world and ourselves. Our impacts may be local in space, but not in time. They propagate onward, through the coming generations and into the distant future. We affect people we will never know, who will live during times we will never experience, with our attentiveness to the problems we face today. We humans are ineffably complex—intricate, nuanced, beautiful, and unpredictable. We have lives composed of triumphs and failures, discoveries and disasters, sacrifices and regret and sadness and loss and love. We are capable of looking across billions of light-years of space and back billions of years in time to investigate the deepest mysteries of the cosmos, and yet, we can live out entire lives beside other people and never truly know who they are—never know the wars they are secretly fighting within them. As it turns out, we are island universes too. Somewhere in the cosmos, hidden within one of the more than 100 billion galaxies, thousands of light-years from the center, revolving an average star among hundreds of billions of others, there is a familiar world. That globe, tiny and obscure, is our refuge from the desolation, our shelter from the darkness, our home in the universe. On this world, experience of the human condition is commonplace, and the comfort we had sought from the universe, we can discover in each other. In the multiverse of humanity that exists here on the planet Earth, we can find solace that we are all, for the first time, puzzling out how to live, and trying to make sense of this vast and extraordinary universe in which we came to be. 1. The emergence of the heliocentric theory was, more precisely, a reemergence. Sun-centered models of the universe had been suggested before - most famously by the ancient Greek astronomer Aristarchus of Samos - but were rejected by the astronomical community, adhering to the geocentric theory. 2. About a decade prior, the astronomer Henrietta Leavitt discovered a link between the period of a Cepheid variable and its brightness; the period refers to the time elapsed while the star undergoes a single cycle in luminosity. Employing this period-luminosity relationship, astronomers are capable of deducing the true brightness of a Cepheid. Upon comparing the star’s true brightness and its observed brightness, the distance to that star can be calculated. 3. Improved measurements have yielded a distance of about 2.5 million light-years to Andromeda. 4. The Milky Way has since been downsized to 100,000 light-years across. Geocentrism might make a comeback! We know from pure combinatorics that there doesn't exist, and never has and never will exist, any chlorophyll anywhere in the visible universe, other than on Earth. Just do the math, something like 500^20 just in terms of combining the amino acids. That doesn't happen independently twice. Evolution doesn't have a say about it because selection can only act on what actually is already randomly materially manifested, never on imaginary potentials. And hemoglobin is the same protein complex as chlorophyll (it simply has an iron atom instead of a magnesium atom). So already there we know that plants and animals only exist on Earth. Maybe unknown chemical processes cause something similar somewhere, but you see how speculative that is. Why haven't our chemists or billions of years of evolution discovered it? Should we assume that we are that stupid? We might very well be the sole masters of the universe! And Earth might remain the center of that universe for billions of years of interstellar biology and civilization that grows from it. Isn't that a beautiful thought! I think it's more fantastic than finding some signature of a creep in the fumes of Enceladus or a radio signal from Andromeda. There's no solid argument against geocentrism as in we being very special. It might well be so. Brace yourself for the most unimaginable surprises from the darkness above. BTW, I understand that Edvin Hubble, the greatest observational astronomer since Tycho Brahe, the discoverer of intergalactic space and in effect of the Big Bang, the beginning of everything, arguably the greatest discovery ever made all categories, didn't receive the Nobel Prize because the committee meant that "Astronomy is not physics and there's no Nobel Prize in astronomy!" As if astronomy was still just a branch of astrological mathematics dealing with the geometry of how points in the night sky move. Well, they've wisened up a bit since then. Even "chlorophyll" isn't a single molecule; there's several versions. And they're a bit unusual, as most chemicals used for light reactions are carotenoids, aka modified tetraterpenes, aka chains of 8 terpenes, aka chains of isoprene; tetraterpenes are thus the simple form (C5H8)8. The modifications are your basic life fare, such as cyclization, partial oxidation, etc. The chlorophylls are believed to have evolved from retinal, a simpler, less efficient photopigment under earth conditions (chlorophyll was able to capture wavelengths that retinal couldn't). Retinal is vitamin-A aldehyde. And indeed, retinal is produced from carotenoids, which are as mentioned themselves light-sensitive and can be used for energy production. It's just basic evolution. Karen, "life doesn't form things by just randomly piecing elements together from scratch" It does! Variation is truly random. That's the variation in the evolution, the mutations. The selection mechanism can only act upon what has randomly appeared. There's path dependence, but that doesn't help the probabilities at all, it just drives one path among the possibilities, given the random starting conditions and the random distortions on the way. Please do the math if you don't believe me. There are about 500 possible amino acids (out of which only about 20 are used in Earth life, there hasn't been time and matter enough to try out more than that here) and the median length of a protein is about 300 amino acids, the shortest is about 100 long, the longest 30,000. So that's 300^500 for the median length protein. Compare that with the number of atoms in the visible universe. Assume that all matter consists only of proteins of the length 300 (i.e. that all stars, all gas, all dark matter were just proteins made up of 300 amino acids, imagine that). Assume also that every protein randomly mutates once every nano second (skip the DNA stuff, just assume proteins magically mutate themselves). Assume that this goes on from Big Bang until the last white dwarf cools down to 10 Kelvin. Assume that no two identical proteins appear, that each mutation creates a unique protein 300 amino acids long. And you won't have a chlorophyll. Do the math and enlighten me if I'm wrong. And I did give a safety margin of about a factor of way way more than 10^100 in the assumptions above, so I feel quite certain. We are very alone! Maybe there are other interesting chemical processes out there, there probably are. But that won't have the slightest similarity with what we are. They won't have stuff like individuality or intelligence or civilization. That might have completely different categories of characteristics, but we do know that it CANNOT have any similarities with us. ... has converged in both bats and dolphins, having made many of the exact same amino acid substitutions, which helps them with echolocation. Their proteins aren't *completely identical*, but they don't have to be; they've converged enough that they're *functionally identical*. Antifreeze proteins have been evolved by plants, arctic fish, antarctic fish (independently), beetles, butterflies, and a variety of microbes. There's a whole class of them, some amazingly similar to each other, some broadly different. There's over 20 different enzyme families which have independently evolved the same mechanism, known as the catalytic triad, where you have a base (usually histidine), an acid (usually aspartate or glutamate) and a nucleophile (usually serine or cysteine) The plant hormones abscisic acid and the various gibberellin molecules have been independently evolved by completely different mechanisms A wide variety of carbonic anhydrases have been evolved by completely different mechanisms, all functioning for the same purpose. Both the Asian elephant and a number of butterfly species have independently developed the use of the pheromone (Z)-7-dodecen-1-yl acetate You mentioned hemoglobin before. Both higher vertebrates and jawless fish independently evolved it. Both the mexican beaded lizard and the short-tailed shrew evolved the same toxin, serine protease BLTX. Both sea anenomes and scorpions evolved the same toxin, BgK. And on and on - there are thousands of examples of this sort of thing. Life *constantly* hits on the same solution to problems on Earth. Why wouldn't it elsewhere? And again to repeat: you *don't have to evolve chlorophyll anyway* - there are countless light-sensitive reactions that can be (and often are) utilized by life. Karen, Random mutation *IS* indeed a fundamental part of evolution. There's no anticipation that performs some kind of a selected variation before the random mutation occurs. First randomization, then selection. And the numbers of the variations are incredible, almost impossible, look it up yourself, I'm not making it up. Yes it would be good to use sunlight (or oxygen) as an energy source. But there is no tendency in randomness to cause such a machine to come into existence. It has so only by pure chance. Maybe there are many other things that also would be good to do, just a few random mutations away from us, but that have never occurred on Earth, and therefor never ever have been subjected to evolutionary selection. Evolution cannot evaluate that which never existed. And almost all possible chemical structures never existed and never will exist anywhere anytime. There are (small) variations of chlorophylls and hemoglobins, nothing is strictly standardized in microbiology. But that is off the point here, they are all very very closely related and could never appear independently again. Do you think that the Platonic usefulness of using sunlight as an energy source is driving what mutations occur in DNA? Including the 300^500 or so protein molecules that never ever came into being? How would that feedback work? Elephants and butterflies are not at all independent. They are extremely closely related. Just a frew hundred million years apart, right? And they have all shared the same bedroom all along. All life on Earth is extremely closely related to each other. There's no independence here. People in the field maybe use the term "independent" for practical reasons in a relative sense. But it has nothing to say about how life came to be or how anything similar might how come into being independently as in without reach of Earthly so called "contamination". ... the same molecule *independently* by *different mechanisms*. A chemical about as complicated as retinal, the also-useful-for-photosynthesis ancestor of chlorophyll. LocalFluff - I'm curious as to your training and credentials with regard to probability and statistics. You keep suggesting that Karen and the rest of us "do the math," but the math you keep trotting out seems like a terribly simplistic interpretation of probability. And your use of the word "independence" seems off as well. Help us get a sense of whether you're citing some established science, or just making stuff up based on your own concept, and give us some references.